Last time we ended with displaying green screen. We set all the needed things on java side and we created Main.cpp on C++ side. Today we will do things that will prepare our engine for going multiplatform. So, there will not be to much fun but it will pay soon in next parts of this series. So, first go into jni folder and create all new subfolders: src, Engine, Game, System and under System also the Android folder. In future there will be some common system files in System folder. Usually some abstraction of some feature like touch input and in folder with concrete system name there will be implementation of this feature. The purpose of the LOG_TAG will be clear soon. You can also see that we will structure our engine with namespaces to keep it clean. In this file additional parameters will be added in future. From here I am switching various debugging features on and off. What we set now is that we say we are using Android (PLATFORM_ID = PLATFORM_ANDROID). We plan to use OpenGL in its version 2.0 and the target resolution for our game is 1280 x 800. The target resolution is not size of your device screen but buffer the OpenGL draws in. It is than scaled to your device screen. *  define some common constants, typedefs, etc. As you can see, while we are working with Android today I left also other systems there. In Eclipse it will be grayed out to mark that preprocessor is skipping it. Next create Log.h and Types.h that have similar structure. You see that its purpose is again just to load concrete implementation from selected system folder. Now we can go into Android folder and implement it. 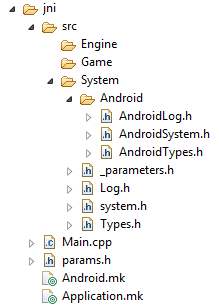 We have selected Android in parameters and our engine now awaits concrete implementation for system, logging and types. Let's make it happy. You see that we abstracted C++ types with our own. In the rest of the engine we will use s32 instead of int or u16 instead of unsigned short. In this way we can construct 32 signed integer needed by engine from int on most of today platforms but in case int was only 16bits on some platform we can construct it from long which will probably be 32bit. But our engine will use s32 and will not be interested what is behind. Here comes into play the LOG_TAG we defined in the top of the Main.cpp. We will define it in every source file so logging will always say us where we used it. You can see that we are benefiting from our parameter file params.h where we set OpenGL version 2. Without any further settings it is processed inside system files and the system is parametrized from one place. With this you should see log messages in the the LogCat. Today we put base for spreading our engine to more platforms in future. Next time we will focus on measuring time.